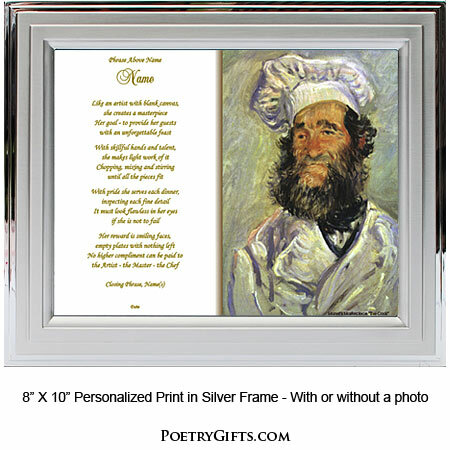 The Impressionist artist Monet sets the tone for this unique poem for your favorite chef. Quality reproduction of Monet's painting "The Cook" is framed in a choice of quality picture frames listed below. Available with or without an area for a treasured photograph. The poem and personalization information are printed in gold colored lettering. 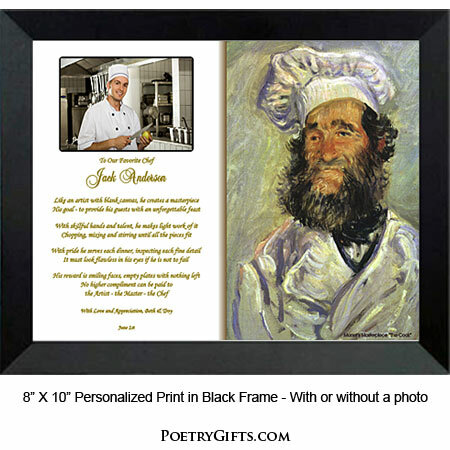 This is an EXCLUSIVE Poetry Gift design and a wonderful way to recognize the talents of your favorite chef. Everyone has a favorite restaurant and it's usually a favorite because of the chef. A great chef is more than just a cook...he's a "Master of his Craft." This impressive copy of Monet's "The Cook" is the perfect design for our EXCLUSIVE Poetry Gift "Chef Poem." Unique birthday or restaurant opening gift or maybe you want to thank your favorite non-professional cook for always serving a beautiful dinner. 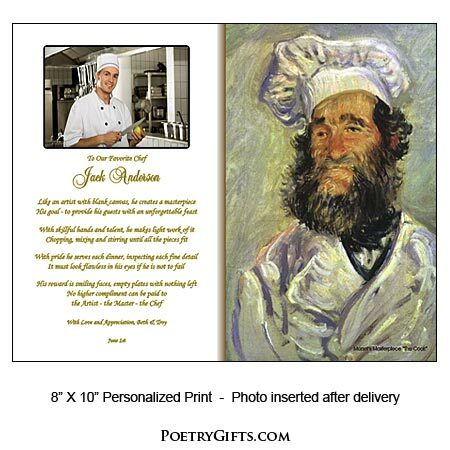 This Poetry Gift is especially appropriate for a professional chef or a chef celebrating an anniversary at his or her restaurant or even opening a new restaurant. Whatever the reason, this Chef Gift will make an impression. We will personalize it with his or her name and a special message from you. Think about how proud the chef will be to hang this Poetry Gift keepsake in the restaurant for all to see!